I love planting onions because it takes very little time for green onions to grow. I usually get my first harvest in 4 to 5 weeks which is a good thing because it is very encouraging to get early produce from the vegetable garden. Fresh green onions are also incredibly fragrant and sweet and can be used in all kinds of cooked dishes as well, like this hearty Sausage, Potato, and Egg Skillet. Cut the root end of the Napa cabbage about half way. Then rip it apart into two separate halves. Repeat the process for each of the half to make four pieces of cabbage. Rinse under running water and drain. 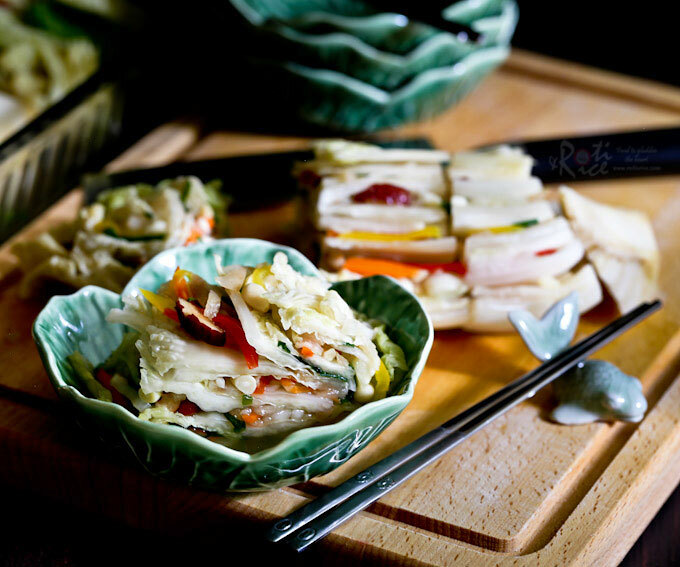 Place in a large bowl and sprinkle salt evenly over cabbage leaves, lifting leaves to sprinkle salt in between leaves. Pour in enough water to cover the cabbage. Cover and leave overnight (6 to 8 hours). Drain and rinse cabbage under running water. Squeeze out excess water and drain on colander for 30 minutes. 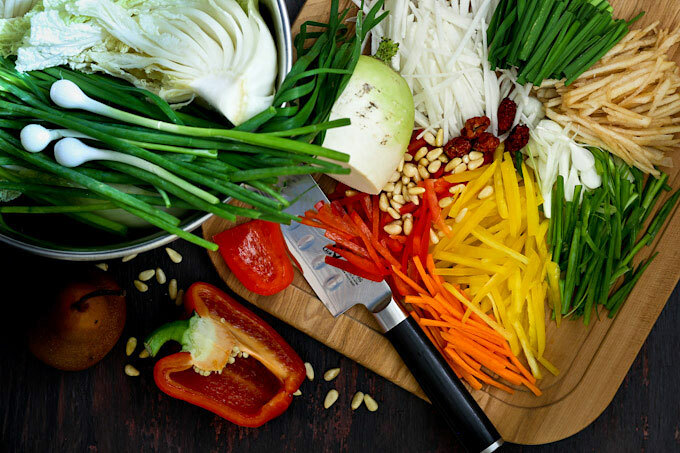 Cut and slice green onions and carrot. Peel and julienne Korean radish and Korean or Bosc pear. Cut Chinese chives and red dates. Mix all the other ingredients together a bowl. Cut off a little of the root end from each of the four pieces of cabbage. Place one piece of cabbage in prepared container. Spread stuffing between each leaf and around the cabbage. Repeat with the rest. 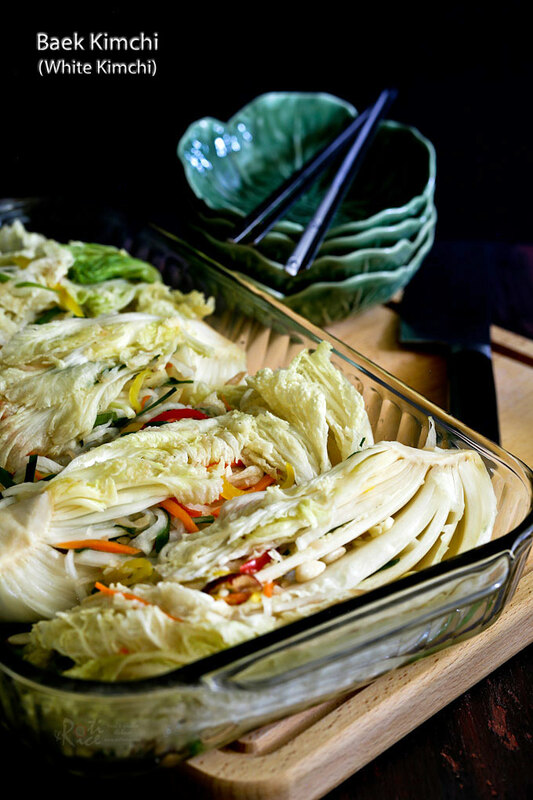 Place cabbage facing up in a container and close the lid. Keep container in the fridge. Container may be left out at room temperature for a day to quicken the fermenting process. After that it should be kept in the refrigerator and consume within a week. 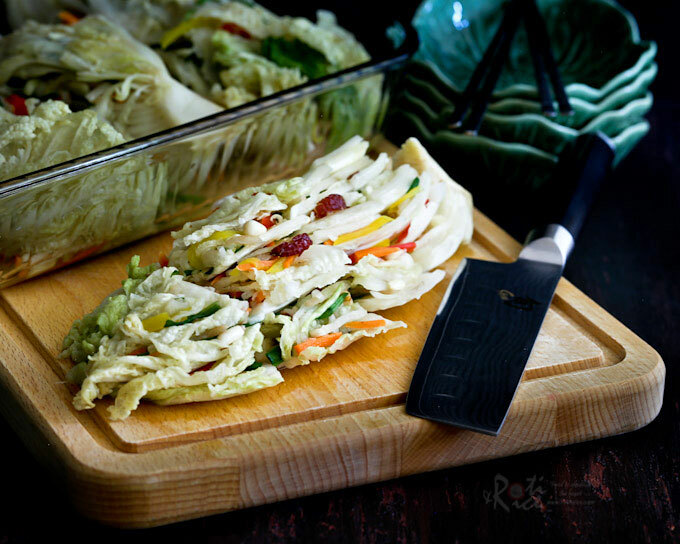 To serve, simply cut off the end of each cabbage wedge. Then cut the stuffed cabbage wedge cross-wise into 2-inch sections. 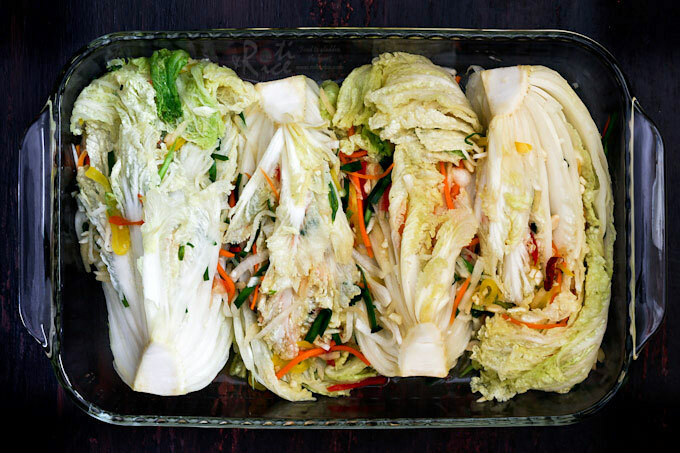 Transfer cut sections to individual small plates and drizzle a tablespoon of kimchi juice from the container over the Baek Kimchi if preferred. 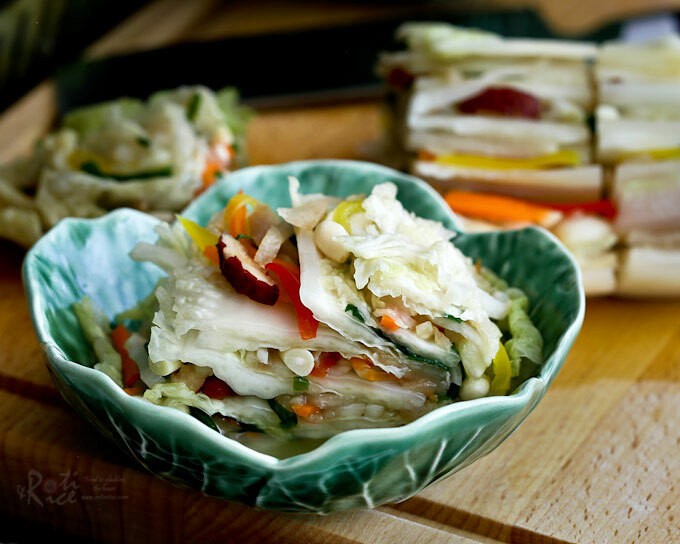 Delicious served with steamed rice or noodles. Do give it a try. I’ve never seen white kimchi before! This is probably going to be less spicy than the normal red kimchi you usually see due to the pepper that isn’t included in this recipe right? Still looks amazing! Thank you for sharing.